Matt Barker, a Westfield Middle School physical education teacher, recently won the Indiana SHAPE Secondary Teacher of the Year award. Barker joined the WMS staff this year. He has previously taught at Monon Trail Elementary School and Heritage Christian High School. He has taught for 14 years. 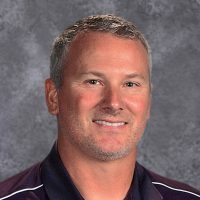 “Before I interviewed for the wellness position here at the middle school, I was notified I would be receiving this award in the fall, so I shared that with (principal) Ryan Haughey in the interview,” Barker said. “So, I think that might have helped a little bit getting the position. In addition to the award, Barker received a $200 grant from U.S. Games, a company specializing in wellness, physical education and athletic equipment for schools. Barker plans to use the grant to purchase physical education equipment for the school. “We get wear and tear on things like balls and hula hoops and general things like that, so (I will use the grant) to stockpile right now,” Barker said. “I know we have some other teachers here doing grants for larger equipment, so I’m just doing general, small things. Barker won the award through a selection process after being nominated. “I was very honored and very humbled I received the award,” he said.